On August 2nd, Chemikal Underground’s East End Social brings an absolutely bloody marvellous day of independent Glasgow music from through the decades to Glasgow Green. It’s part of the Glasgow 2014 Cultural Programme, doors open at 10.30am and it’s free. 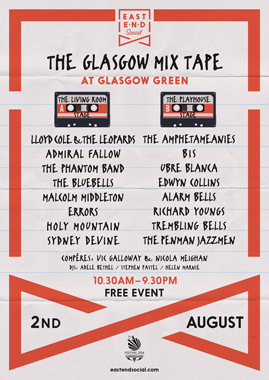 You can find out more about the Glasgow Mix Tape here and about the East End Social here. This entry was posted in Interviews, Journalism, writing etc. Bookmark the permalink.